League of Legends’ most-neglected champion will be getting an update before the new year, the game’s developers have confirmed to Kotaku.The increasingly out of place champion Poppy will finally be getting the update that fans have been asking for since 2013. A Riot rep told me yesterday that Poppy’s revamp has been in “active development” since the end of the summer, though they’d started coming up with visual ideas just before that. The works seems to have sprung from efforts to work on female yordle characters in general—”yordles” being the name of League’s cute fuzzy hamster-looking creatures like the iconic master-troll champion Teemo.. Tristana, a chipper yordle who wields a massive bazooka-type launcher and is similar in size and shape (if not in actual gameplay mechanics) to Poppy, received a major aesthetic and mechanical overhaul with League’s 5.2 patch in January. The same can be said for her in-game abilities and character stats. 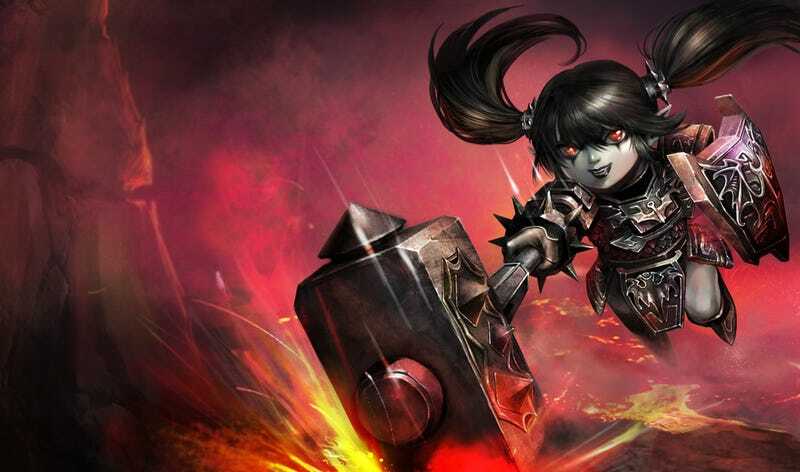 The only thing standing in the way of Poppy’s re-release is League’s upcoming marksman update, which is going to change a few of the game’s ranged characters in big ways—much like the previous “juggernaut” update did with four beefy melee champions. Riot told me that League players can expect to see a similar number of champions addressed in the marksman update as they did with the juggernaut one, so I guess that technically means Poppy is now fifth or sixth in line in the game’s ongoing champion update schedule. The core problem with Poppy, according to Riot and many League of Legends players that I’ve spoken to for this story, is that she’s somehow both incredibly weak and comically overpowered. She flits between these dramatic extremes over the course of almost every game she’s played in. Poppy’s shield makes it so she’s immune to any enemy attacks except for those coming from the opponent she targeted for 6, 7, or 8 seconds, depending on what level she’s at. She’s a melee fighter, so the way Diplomatic Immunity ends up working in practice most often is: at the start of a big team fight, Poppy will cast the spell on whoever deals the least amount of damage, plunge headfirst into the enemy team, and focus her attacks (along with her teammates, if everyone’s coordinating properly) on whoever’s easiest to kill. Diplomatic Immunity lasts for six seconds at minimum. An entire team can be obliterated in a fraction of that time. If you combine the ability’s abnormal endurance with its already obscenely powerful premise, you can see how this tiny little hammer-wielding fuzz monster can somehow body block an entire enemy team, kill them one-by-one, and make it out of a team fight unscathed. ...and make quick work of her with the help of his teammates. For a monstrously powerful ability, Diplomatic Immunity isn’t even that hard to pull off—all you have to do is point and click on someone. The worst thing that can happen is Poppy might click on the wrong opponent. But even then, she’s still invincible to everyone else on the enemy team. Riot told me that Poppy’s character design was set up with “painful weaknesses” in order to help mitigate the ridiculousness of Diplomatic Immunity. Since it’s the last of her special abilities she can unlock, the primary way Riot attempted to balance its power out was by making her base stats and the rest of her abilities—the one she has access to early in a match—weaker than they’d normally be for a typical melee warrior champ. That’s what also makes her very weak. Poppy’s weak spots have kept her from dominating every single game she’s played in, but they’ve also meant that she has to climb an exceptionally steep hill over the course of a match in order to access her true power. Poppy players often spend the first 20 to 30 minutes of a game (or even longer!) trying to scrape by, stay alive, and maintain the champion’s positive momentum. A smart opponent will try and impede Poppy’s progress by aggressively bullying her—pushing her back behind her base’s defenses and lunging for her whenever she gets too far out of their range. Even if Poppy players managed to survive the early game and start beefing themselves up to wreck everybody once Diplomatic Immunity is up, a significant chunk of any match played with with her just isn’t much fun. Playing against her also means that people aren’t faced with a legitimate challenge at the beginning of a match…and then put against a terrifying one towards the end of a match. The weirdest part of Poppy’s story is that none of the issues with her are new. The many glaring faults of her character design have been well known by the League of Legends community and identified by Riot itself for years now. League of Legends is a very large game that’s also hugely popular. There are currently more than 120 characters in its champion pool, and they’re all played by around 27 million people every single day. Riot certainly has its hands full every waking moment when it comes to fixing, updating, and reworking things in League. But even then: how does one of the most successful and acclaimed video game developers in the world let institutional decay like Poppy’s occur? A more reasonable explanation for Poppy not having a real place in professional-level League of Legends play is that she’s just not good enough to hold her own in most games. Riot suggested that pros might not like her because she’s unpredictable. Remember: if she doesn’t make it over that early-game hump, she’s useless to her team. And when you’re up against the best League players in the world, it’s very easy for her to be shut down and the game lost before she even has a chance to start dominating in team fights. While amateur League players don’t usually play at the same level as the pros, Poppy still has the same problems in the little leagues. She’s just not a “real pick,” as Morello himself admitted, which means she’s never been really popular in the game. While other broken characters might attract enough attention that they’ll inspire shouting contests on Twitter, YouTube, Twitch, the popular League of Legends subreddit, and any number of League-friendly spaces online, Poppy’s just sort of...sitting there, gathering dust. The longer that Riot’s gone without giving League fans a satisfying solution to their Poppy problems, the more out of place she’s come to seem in the game. Gameplay qualities aside, Poppy just looks sort of…off by modern League of Legends standards. Seeing her in action in-game or looking at the splash art Riot’s made for her assorted premium skins feels like you’re looking at Homer as he was drawn in the nineties pop into an episode of The Simpsons released today. Many people in and outside of Riot have taken to describing the Poppy rework as a “Sion-level project,” referring to an impressive transformation League’s developers achieved when reworking that champion. The Sion rework transformed the champion from a forgettably generic zombie monster voiced by a bad Arnold Schwarzenegger impersonator into one of the best characters Riot’s ever produced: a terrifying undead juggernaut. It would be worth the wait for League fans if Poppy’s rework ends up being anywhere near as good as Sion’s. Poppy’s rework became news in the League of Legends community again last week when Riot revised their champion update schedule to put her just below the upcoming marksman update. Even though people were happy to see her up near the top of Riot’s current to-do list, they also made it clear to Riot that they’ve been snubbed enough times with promises of Poppy’s rework that they’re not holding their breath. A Riot representative jumped in shortly afterwards to try and assure them.